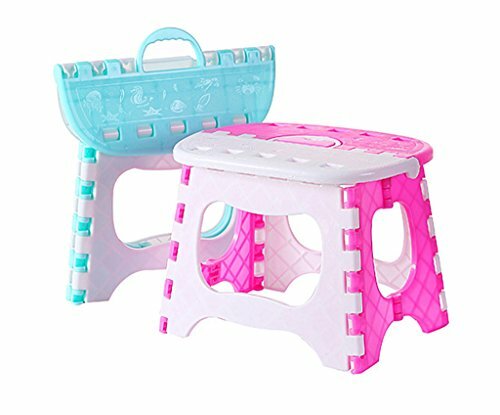 Alimitopia 2pcs Kids' Folding Step Stool with carry handle,Portable Children Foldable Campstool Chair for Indoor or Outdoor Use by Alimitopia at Indsight. Hurry! Limited time offer. Offer valid only while supplies last. PORTABLE&CONVENIENT-Easy to carry for children with the comfortable handle,save your storage space after folding. UNIQUE DESIGN-Etched cartoon patterns on the surface ensures skid resistant.Round corner design avoids collision damage. QUALITY MATERIAL-Made by quality engineering load-bearing plastics,it's safe enough for children. MULTIPURPOSE-Ideal rest tool for bathroom,garden,camping,fishing,travelling,etc.